But I also wonder if there isn’t an element of the following: it can be disorienting to have our immediate physical environment disrupted. That’s the whole issue right there: change is hard. If you’re a wealthy Prospect Park West resident or home owner and you’ve never paid attention to or attended Community Board meetings, if you don’t belong to a neighborhood civic association, or if you don’t follow transportation issues, it may seem as if the PPW redesign was implemented overnight. One NBBL member even testified at the City Council hearing on bicycles that she and her husband returned from vacation to find, with some shock, that the street had been changed, it seemed, overnight. Well, if that was the first she learned of the change, then of course it would be a shock to the system, like coming home to find that they key to get into your apartment now has to be turned to the left after years of turning it to the right. As a giant aside, that’s not to say that there aren’t NBBL members who aren’t involved in their local community. Lois Carswell is a former chairperson of the Brooklyn Botanic Garden board and an active volunteer there, from what I understand. Others have undoubtedly donated time and money to the Prospect Park Alliance, Brooklyn Museum, and other institutions. Many more lived in Park Slope long before the waves of gentrification began, fixing up brownstones and working to make the neighborhood safe. I met Lois Carswell shortly before last October’s rally and, during a pleasant conversation, thanked her for her part in making Park Slope the neighborhood I know and love today. But now, after decades of incremental change, something is different. The neighborhood, or more specifically the street, many people have known for perhaps thirty years or more has changed. On top of that visual change, privileges they were used to for decades–driving speeds, parking–have also changed. …the accident reports we have received indicate that accidents are occurring at a far greater rate after the installation of the bike lane than before. These reports strongly suggest that the bike lane is the direct and proximate cause of these accidents. Given all of this change, it’s not surprising that it seems as if the “accidents are occurring at a far greater rate after the installation of the bike lane.” These “accident reports” are anecdotal and self-reported accounts collected from many who are sympathetic to the “no bike lane” cause, and not, as far as I know, verifiable before and after reports from the NYPD, other city agency, or disinterested party. And that’s where the shock of the new or different comes into play. It’s human nature to start noticing something more following a big change. After my daughter was born, my ears would pick up whenever I heard a story about children on the radio. Was NPR suddenly running more stories about kids at the end of 2009? Was my daughter’s birth the “direct and proximate cause” of their new focus? Of course not. All that happened was what happened to me: there was a big change in my life that caused me to pay attention to those kinds of stories more. It’s just one example of a phenomenon we experience all the time. When I leased a blue Volkswagen Jetta shortly after moving to Atlanta in 1996, I suddenly noticed all the Volkswagen Jettas on the road, especially the blue ones. Some things make us pay more attention to something that previously wouldn’t have caused us to even blink. The accident reports to which Walden refers don’t suggest that the bike lane is the “direct and proximate” cause of anything more than people noticing accidents more than they used to, whether or not those accidents are greater than, lower than, or exactly the same as they were before the street changed. (For the record, they’re lower.) Factor in an aversion to change, and even an aversion to bikes, and there’s all the more reason to start paying attention to accidents more, even if they might not rise to the level of anything to report to the police. I doubt too many NBBL members were out collecting accident reports before the bike lane was put in, and that, right there, should be enough to tell us what’s really going on here. 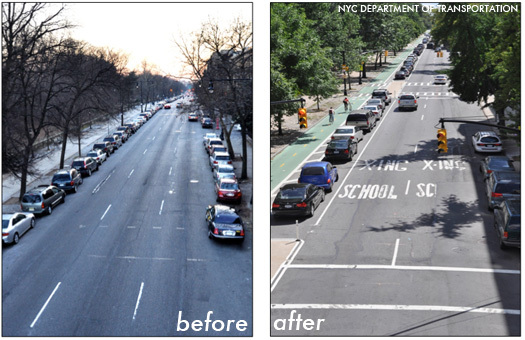 Why are people on Prospect Park West now paying more attention to traffic? The bike lane made them do it. Excellent post. Too bad the opponents are not interested in reason.